Hey there, friends! I’m so excited to be joining the Altenew December 2018 Stamp/Die/Paper Pack Release Blog Hop! If you’ve started the hop from the beginning then you would have come from Sveta Fotinia’s Blog. If you’ve started here, WELCOME! I’ll have a link to the next person in the hop at the bottom of the post; along with a complete list of hoppers. I was so honored to have been invited to participate in this blog hop and Altenew sent me some really fun goodies to play with! I was sent the Verdant Walk 6×6 Paper Pad, the Pastel Dreams 6×6 Paper Pad, the New York Stamp Set, the Delicate Primrose Stamp Set and the Flower Vine Stamp Set … and WOW! Altenew products never cease to amaze! I immediately fell in love with the patterned papers, and I knew I would use them as my focal points for my scrapbook layouts. The New York Stamp Set was the inspiration for my first project. I started with multiple patterns from the Pastel Dreams Paper Pad for my first layout. I wanted to use as many patterns as possible so I used a cut file from The Cut Shoppe to spell out my title, New York New York. I added hand stitching detail to each of the pattern papers. I positioned the letters on the top and bottom of the layout; leaving an open space in the middle of the layout. I positioned my photo on the layout and used the New York Stamp Set right next to the photo. I started by placing the stamp on the Tim Holtz Stamp Platform and used Tattered Rose Distress Oxide Ink. I wanted to create a mixed media, watercolor look with the stamp set so I lightly sprayed the stamp with water after applying the ink. I then cleaned the stamp and applied another layer of ink and stamped directly on the background (without using water this time) to get a more of a detailed image of the stamp set. I also added stamped words from the same New York Stamp Set around the title. I fussy cut numerous floral images from another patterned paper from the Pastel Dreams Paper Pad and scattered the flowers around the layout. I also used a few wood buttons from the Reflections Scrapbook Kit and enamel dots from the Our Family Scrapbook Kit. Now you can check out my process video showing how this layout came together! For my second project, I focused on the Verdant Walk Paper Pad. I fussy cut the hanging florals from 2 of the matching papers from the paper pad and positioned the florals at the top of the 12×12 white cardstock background. I added a wash of light peach watercolor under the florals and allowed the color to run down the page. I also stamped the Flower Vine Stamp Set in that same area. I love the hints of gold peeking out from behind those beautiful fussy cut florals! I then essentially created a grid with my photos and embellishing underneath the fussy cut florals. I used tissue paper and another patterned paper from the Verdant Walk Paper Pad to back my photos. I added my title using black alphas, from the Altenew Reflections Scrapbook Kit, to the right and left of my photos. I wanted to bring in a little more black to help the alphas mesh with the layout, so I fussy cut numerous florals from the Verdant Walk Paper pad. I added in a few enamel dots around the page for added detail, added my journaling under the photo along with the date, using the Altenew Date Stamp. Here’s a process video that shows how this layout came together! Altenew has also kindly offered for me to give away a $30 Altenew gift certificate! All you need to do to enter the giveaway on my blog is to leave a comment on this blog post! (To leave a comment, head to the top of my blog & click on the number to the right of this blog post title.) I will be announcing the winner of the $30 gift certificate on my blog on December 18, 2019, so be sure to check back to see if you were the winner! There is so much talent in this blog hop and I have no doubt that you’re finding inspiration as you’re making your way through! Next up is Nicole Picadura. If you have a kiddo around the age of 10 then I can almost guarantee that he/she has an obsession with electronics. My 10 year old son, Aidan, is no exception. I wanted to document his love for his electronics so I grabbed the Better Days Cut File from The Cut Shoppe. I sized and cut all of the days of the week from the Better Days Cut File in black cardstock so each word would fit in a vertical line down the layout. The Bella Blvd Alex Collection has a lot of gaming themed embellishments so I knew it would be perfect for this layout. I wanted to highlight each word from the cut file so I grabbed a few acrylic paints from my stash that matched the Alex Collection. I used a dry paintbrush and added a strip of paint behind each word in a rainbow order. I positioned my photos on the right & left of the cut file words and added numerous game themed die cuts, tabs and stickers from the Alex Collection. I also added journaling using my We R Memory Keepers Typecast Typewriter , cutting it into strips and adding it under the photo. I wanted to add a bit more detail to the layout so I used color on color stickers on the paint strips, added Black Heidi Swapp Color Shine splatters and stitched Tim Holtz Tiny Alpha Stickers on each photo. Now you can take a look at my process video to see how this layout came together. 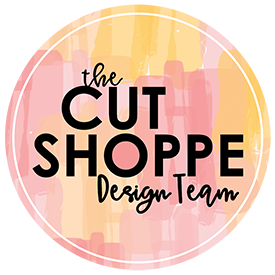 Thanks so much for joining me today and remember to visit The Cut Shoppe Etsy Store to check out all of the cut files!